Many are the important points to know if a property is right for you or not and know how to analyze in a good way the essential aspects will always lead you to achieve better deals and find in this way to achieve success in your investments or in the fulfillment of the work for the clients that hire you. From the beginning you must be very clear about what you want, how you want it and how you are going to negotiate to have a line that can be followed no matter what happens in the middle of the process. Your criteria will be the one that leads you to choose the right property for you in the right way. This must be done always, not only in the middle of a process of analysis or property search, because only then you will have a clear idea of ​​what the scenarios could be within any negotiation. 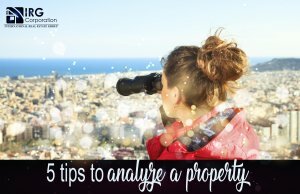 Benchmarks can help you establish a better idea of ​​the real price of a property you are analyzing. Uniting the above mentioned with the distribution and basic amenities will give you a clear idea of ​​how much you can offer without feeling that you are giving too much. Being honest with yourself at critical times can save you from unexpected situations and, above all, from encountering deals in which you feel you are losing. Objectivity is a fundamental tool in the real estate to be able to make the correct calculations and lower the probability of error. This is basic, the more information you have about the properties that you analyze the better the estimate will be after that study. Every piece of information you have in your hands when choosing is crucial to make the right decisions within the market. Much of the work is done in this previous stage where research and comparison are your main tools to determine if a deal meets your requirements, after all, you are the only one who can know if something is really beneficial for you or not . Cultivating these strategies intelligently can be done through time an expert in the analysis of properties leading you to achieve all your goals established in the beginning. Philosopher, author of self-help and motivational speaker from the United States. Is it a Good idea to Refinance your Property?